Vitamin D-3 2000 IU 250 caps. It is common knowledge that vitamin D is naturally synthesised by the human organism under the influence of sun rays. That is where its common name comes from – “the sunny vitamin”. Unfortunately, the climate of northern Europe is not beneficial for the synthesis for most of the year, which leads to serious deficiencies in the inhabitants of those regions. 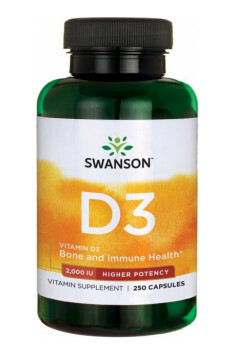 Therefore, it is necessary to supplement vitamin D, especially in autumn and winter. Additionally, seniors and obese people should supplement the vitamin throughout the year. The large amount of vitamin D in the supplement means that for most people, one capsule taken with a meal is enough. In people particularly prone to its deficiency, the dosage can be increased to two capsules.